Still undecided about the real candidates? 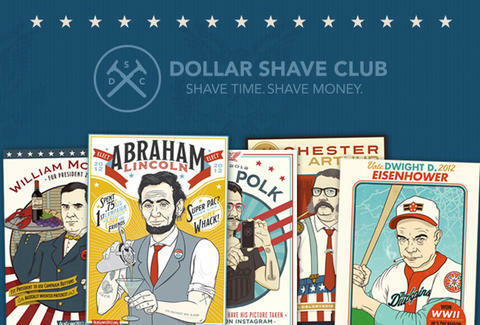 Well thanks to the geniuses at Dollar Shave Club, there are other options. Check out their Old Glory 2012 Presidential Election and vote for the past president that you feel deserves a second shot at glory -- like Grover Cleveland, only even more non-consecutive! Plus, If you cast your ballot for the winning candidate, you’ll win a free month of razors, and life will be sweet. Just visit www.OldGlory2012.org to vote for one of the 16 candidates featured on original works of art. Each hilarious poster also shares some little-known facts about the presidents -- and in Polk’s case, a little-known Washington Monument tattoo. This is your chance to secure meaningful change…in your pocket, when you stop overpaying for razors.